When Cara announced her Blogiversary Bash I knew I had to participate. Unfortunately, at times I can procrastinate, we all have our faults, don’t judge, I sat on my idea and let it simmer and bake for way too long. I apologize Cara!!! Nonetheless, here is your belated blogiversary present. The bash got me thinking about which movies I love the most. I am sure most of us out there in the movie Blogosphere have a million favorite movies to narrow down, so the task is not an easy one. 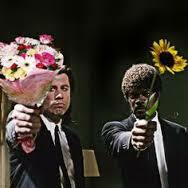 My favorite movie, hands down is Quentin Tarantino’s Pulp Fiction. It is a movie that has gotten me through my teenager years, one that I popped on when I came home from wild nights partying in college, it lulled me to sleep and helped nurse my hangovers and one that I always watch whenever it is on TV, no matter what part is on. Now 20 years later, it has stood the test of time and resides in the category of an ultimate classic. I mean a classic royale, with cheese of course. Here are my top 10 reasons why Pulp Fiction is still one of the coolest movies ever. 1. The dialogue: I can only imagine the actors opening up that script and seeing what awesome nuggets of dialogue there was to be hold. 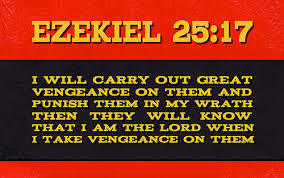 From the opening diner scene to Jules’ ability to hash biblical psalms to giving us catch phrases that to this day are still used. 2. The soundtrack: The way that Tarantino was able to perfectly meld the music to what was happening on screen can be described as magical at best. Pulp Fiction brought John Travolta back to his dancing roots with the iconic Jack Rabbit Slim’s dancing contest done to Chuck Berry’s “You never can tell.” And who could forget the jam, “Jungle Boogie,” when I hear that song nowadays, it instantly makes me think of this movie. 3. 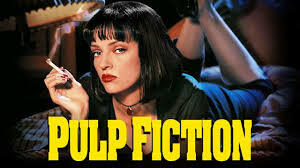 Two Words Uma Thurman: She is the epitome of Pulp Fiction. Her character of Mia Wallace is one of my favorite female Tarantino characters ever. Uma served as Tarantino’s muse and it is obvious why, with her piercing eyes and smooth voice, she was the coolest of them all daddy-o. What did the mama tomato say to the baby tomato? Ketchup. 4. The Heroin Overdose Scene: If you were only to watch one scene in this entire movie, which would be a sin in of itself, but if you absolutely had to, this would be it. The banter between Vincent Vega and the drug dealer was funny, interjected in a moment filled with sheer craziness, and the suspense of reanimating Mia Wallace back to life with a shot of adrenaline was intense to say the least. 5. The MacGuffin: The suitcase that metaphorically carries so much weight in the movie still remains a mystery to us all. What was inside and what were the two men chasing? We will never know and it is up to you to make your own assumption about the contents of the suitcase. 6. Three Words Samuel L. Jackson: If Uma Thurman was Tarantino’s muse or goddess of inspiration, then Samuel L. Jackson was his Apollo, the god of light, poetry and knowledge. 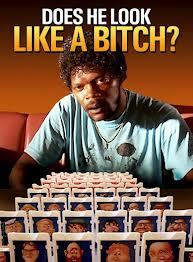 Every line that emanated from him as Jules Winnfield was prolific and enlightening. He taught us that rubbing another man’s wife’s feet is considered cheating and that the act of killing is comparable to playing God. He did not play Jules as your average simpleton hit man, but one that thought of every act of killing with such consequence and thought. Not to mention he probably has the best lines of the entire movie. 7. The Wardrobe/Costumes: As simple as they were, the wardrobes of this movie are iconic. The black and white suits worn by Vincent Vega and Jules and Mia Wallace’s button up white shirt and black capris. The black and white effect played well with the hip nature of the movie. Also, the clothes that Vincent and Jules change into after they clean up the car that Marvin was killed in. 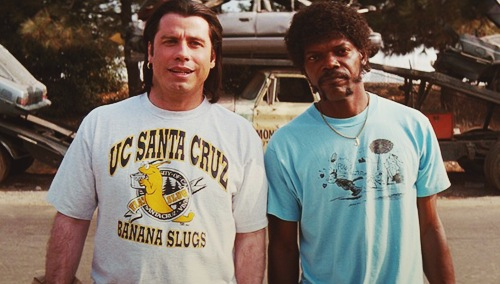 Vincent wears a shirt with Tarantino’s alma mater of UCSC, while Jules lounges around in running shorts. 8. The Kahuna Burger Scene: For me this is one of my favorite scenes and one that stands out as having the most singular mark of Tarantino. Jules stands in front of Brad and questions him, asking him “what does Marcellus Wallace look like,” to which he keeps answering “what.” Each time angering him more and more, and fervently making him feel even more God like with every question. As this is going on, Vincent is standing in the back, almost bored. These guys are used to killing people and to them it is just their job. 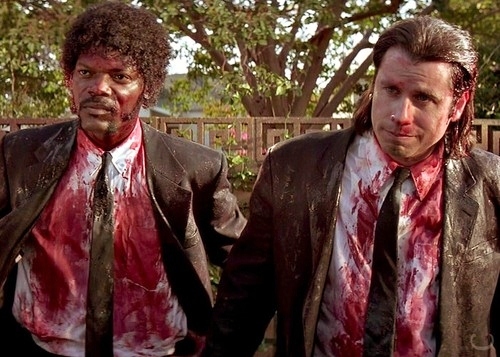 Only Tarantino can create a killing scene that is in a way light-hearted, since it opens up with him asking for a taste of his delectable Kahuna burger and then turns riveting and full of suspense. This type of set up works in every movie from Reservoir Dogs to Django Unchained, this back and forth banter with killer and victim is priceless. 9. The Editing: Sally Menke had a long-time working relationship with Tarantino. The way she edited this film was phenomenal. She was able to create tension out of everyday moments like Vincent Vega and Mia Wallace looking at each other over the diner table, while he sipped his amazing 5-dollar milkshake and she watched while chewing her gum. The feeling of awkwardness and anxiety was palpable with the silence between the two. The whole movie is told with the disjointed editing of the story, it jumps back and forth in time, but in the end the whole film comes together beautifully. 10. The Supporting Characters: All the characters in the movie are unique, yet put together comprise a film like no other. Each one tells a different story, giving the viewer a snippet of foreshadowing and a deeper understanding of the main characters. Butch’s father, Capt. Koon’s relationship to his watch and his son was heartwarming and odd. Pumpkin and Honey Bunny, their twisted relationship opens and closes the film. Lance the drug dealer and his girlfriend Jody, together they are kooky and add hilarity and edginess. The Wolf, the no nonsense, perfectionist cleaner, who knows how to leave a crime scene pristine and glistening like no one was ever there. Together these characters helped form a movie that has stood the test of time. Hope you guys enjoyed my Blogiversary present! Who else loves this movie as much as I do? Honestly I never really understood the point of The Wolf. Basically he told them to take a shower and wipe down the car. This is a pretty great movie and easily one of the best from the 90’s. No film out there like it. Ohhhhh thank you sorry so late on replying been moving and super busy at work. 😦 I wish I would have got this in earlier, but hey it’s still a present! Thanks Cara! Oh yes so much work, I feel like I haven’t written in forever. 😦 Thanks Cara! 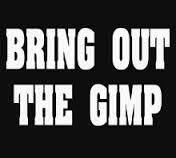 Come back to us when you can!! We miss and ❤ you!! Hi Queen Mel! It’s been ages since I saw this so my memory of it is a bit hazy, but yeah I remember the snappy dialog and how funny it was considering it was so darn violent. Hello Lady Ruth!! My friend, I need to get caught up, I have been so busy as I am moving and work has been annoying lately. Yes this movie is way too violent for our Lady Ruth, and way too much blood. Let’s just imagine Toby in a Tarantino movie, would actually probably work! I’ve missed you dahling! But totally understand life gets busy! Where are you moving to? Still in San Diego I hope. Oh yes well I think he is starting to get more roles or at least we are seeing more of him. We just need big directors to start recognizing his work. Ohh yes Jane Eyre, he’s so good in that, perfect movie for a Toby fix. I need to re-watch that, so heart wrenching! Ok gf.hope you have a great weekend!! Such a good movie. I’ve seen it many times and it never gets old. Fun post! Thanks Dan! Agreed I could watch this a million times and each time have fun with it!